Would you like a think tank advocating acts of terrorism, war and suppression of the media working with Facebook to protect democracy and elections worldwide? If so, great news! Facebook is “excited to launch a new partnership with the Atlantic Council, which has a stellar reputation looking at innovative solutions to hard problems,” Katie Harbath, Facebook’s director for global politics and government outreach, announced on Thursday. “Experts” from the Atlantic Council’s Digital Forensic Research Lab (DFRL) will work closely with Facebook’s “security, policy and product teams” to offer “real-time insights and updates on emerging threats and disinformation campaigns from around the world,” Harbath added. While this will likely be cheered by those who still believe that Russian agents acting on personal orders of President Vladimir Putin’s pet bear used Facebook to hack American democracy, everyone else just got a whole list of reasons to be worried about Mark Zuckerberg’s ability to suppress what he believes to be Wrongthink. The Atlantic Council is basically the academic arm of NATO, an aggressive military alliance that equates freedom and democracy with depleted uranium and regime change in places like Yugoslavia and Libya. The think tank itself hosts lively debates between people who hate Russia and people who really hate Russia. Such is its commitment to Western liberal values, the think tank actually advocated terrorist attacks in Russia and demanded that Russian news outlets be forced to register as foreign agents – a demand that was actually put into effect shortly thereafter. As for the haughtily named Digital Forensic Research Lab, it employs such luminaries as “couch analyst” Eliot Higgins, aka Bellingcat, and is led by Ben “grammar errors make you a Russian bot” Nimmo. A recent “expert analysis” by DFRL commissioned by the British government resulted in accusations that real, live people are “Russian bots” only because they dared express opinions differing from those officially sanctioned by the mainstream media. Yet the top two examples used in the report, Ian56 and Partisangirl, both turned out to be real human beings – one a British man and the other a Syrian living in Australia. Nimmo then tried to wiggle out of the hole he dug for himself by calling the two “trolls” rather than bots, but nonetheless guilty of pushing “Russian” narratives. 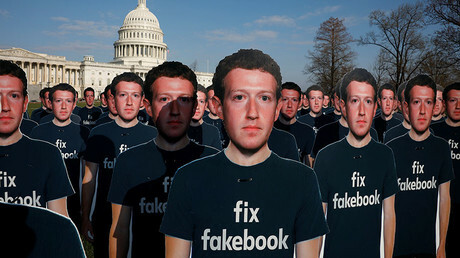 Having connections and access to power and influence certainly doesn’t hurt, especially when Facebook is being raked over hot coals by politicians eager to blame Zuckerberg’s multibillion-dollar enterprise for failing to win elections they believed they were entitled to. Last month, Facebook also announced it would rank news sites based on “trust.” No details were given as to how that scheme might work, but Facebook has already partnered up with several mainstream media outlets to “fact-check” news. You know, the same mainstream media who on Wednesday breathlessly reported the fake news that President Donald Trump had called illegal immigrants “animals.” Even a cursory viewing of the event, live-streamed on YouTube, could reveal he was talking about the notorious gang MS-13, but very few outlets bothered to check. So far, only the Associated Press has retracted the report, acknowledging that it was erroneous. That leaves the question of who will fact-check the fact-checkers. Facebook seems to believe the Atlantic Council will.